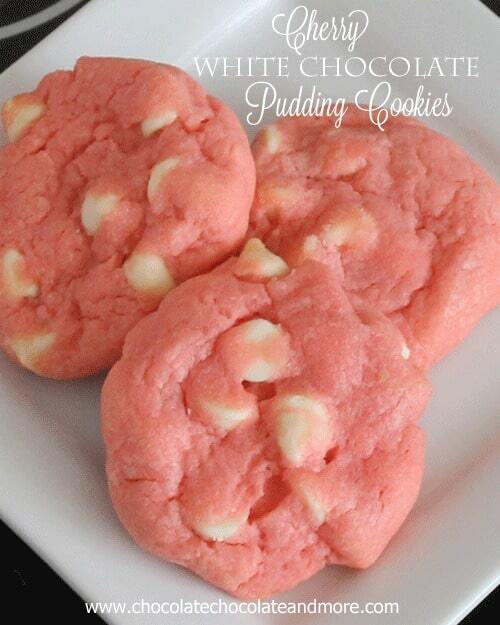 Cherry White Chocolate Pudding Cookies - Chocolate Chocolate and More! It’s almost Valentine’s. This is probably the last year I’ll get to make treats for my daughter’s class. She’s in 5th grade and I guess when you get to middle school you’re too grown up for things like parties in class and sweet treats made by Mama. Only 4 months left to make treats for my baby. I’ve got every possible occasion marked on my calendar. St. Patty’s, Easter, Field Day, her Birthday, end of year party. You moms all know what I’m saying. It’s going to be different next year. When I saw these cookies from Sally’s Baking Addiction, I just had to run to the kitchen. So pink, so pretty and a great flavor combination! I love using Jello in baking and I knew I could make something almost as pretty with what I had in the cabinets. Yes, I have partial packets of Jell-O in my baking cabinet, as I’ve told you before, using it as a flavoring is the bomb. Just try adding a tablespoon of it to a vanilla milkshake! I made 2 different recipes for these cookies. This is the recipe the family voted to share. I’m still going to work on the other one. I think it has possibilities. Cream butter, sugar and Jello together. Add eggs and vanilla, cream again. Combine flour, pudding mix, baking soda and salt in a separate bowl then slowly add to butter mixture. Once all combined, fold in chocolate chips. Spoon cookie dough by rounded tablespoons (I use a medium cookie scoop) onto parchment lined baking sheet. Bake in a preheated 350 degree oven for 8-10 minutes. Let cool on cookie sheets for 5 minutes before removing to racks to cool completely. 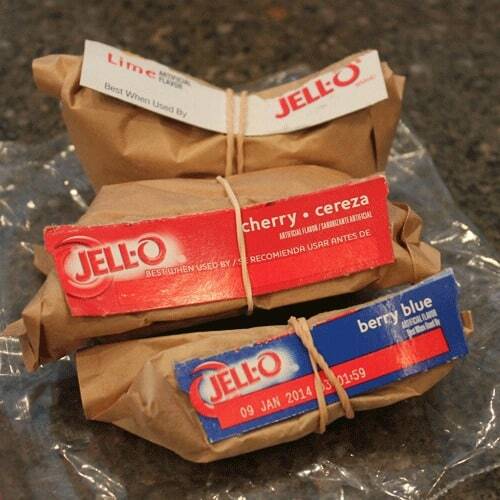 Want more recipes using Jell-o? These are so pretty Joan! 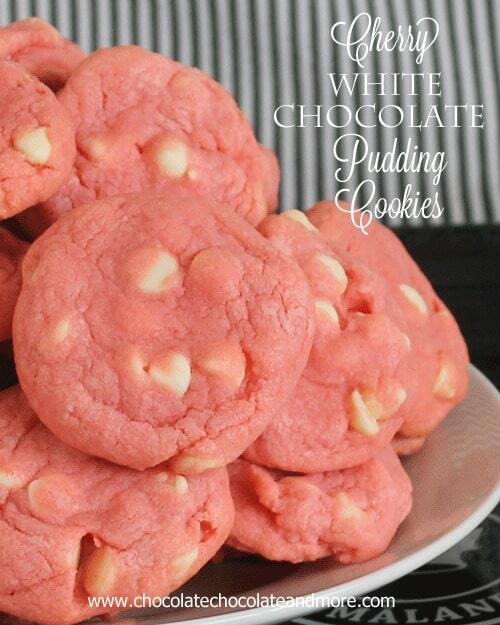 I need to make pudding cookies. It’s been too long! I just wondered if recipe would be be same with sugar free jello? Yes, you can use the sugar free Jello. These are gorgeous and perfect for Valentine’s Day. Just to share a little secret, I have partial pudding and jell-o packet in my cupboard too. 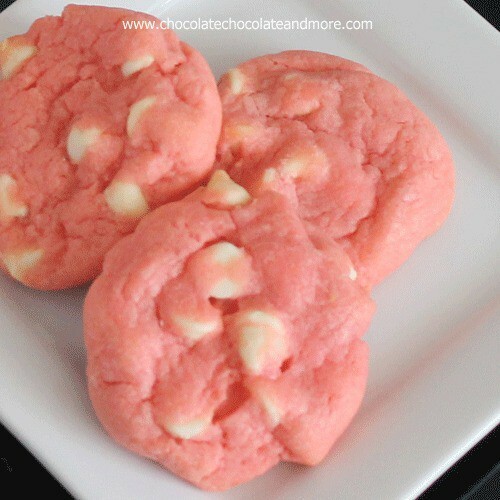 Perfect for Valentine cookies! I’ll be making these! Thank you! So pretty and delicate! Bet they taste just fabulous. Not only for Valtentine’s day but also a bridal or baby shower – beautiful! These are a perfect color! Kelli is right – perfect for a girl baby shower! I hope you’ll link up at Off the Hook! Such a pretty pink! I am going to have to try adding Jello to my cookies! I’m missing out on something here! Oh, don’t tell me that it all ends in 5th grade???? NOOO! Pretty cookies, Joan! These would be perfect for Valentine’s Day! We just found your blog. You have a great blog with yummy recipes. These cookies are very temping!! YUM! We are hosting our 2nd link party tomorrow and would like to invite you to link up with us. Our schools don’t allow home baked treats even in the elementary schools :(. Still, it was a shock, after 10 years in a row, to not be a “room mother” when my youngest went off to middle school. Maybe that’s why I send my son so many college care packages! I understand your sense of baking urgency :)I have been using different varieties of pudding mix in cookies but I haven’t tried jello yet. Your pretty pink cookies have convinced me. They sound great! It’s been a little too long since my last pudding cookie…I’m feeling the itch to get in my kitchen and bake some!! I love how pretty and pink these are. So fun to use cherry jello for the flavor too!!! Are you using instant pudding or cook-type pudding? I can’t wait to try these. I love the idea of a cherry flavored cookie, something I haven’t had before. The colors are perfect for Valentine’s Day! Thanks so much for sharing! Have a great weekend! check out delicious cookies. will have some!!! these are just so pretty! Too good to eat! Thanks for the recipe! They are so pretty. I need to make these for my grands. Thank you for sharing. So totally original! I’m stopping by from Couponing & Cooking blog hop. Do you think this would work with other flavored jello? Oh yes, Any flavor will work. I can tell you the Lime Jello will look a little dull in color, same goes for the Berry Blue. You can add a little food coloring to brighten them up. The flavors are still great! YUM!!! Do you think I could make these as a bar? What would you suggest for pan size and cooking time? Thank you! I love this for Valentine’s Day! I, of course, love these. 🙂 So amazing and gorgeous. I need to try your version with pudding and jello mix! I love these cookies Joan! I used the Jello in cookies and was supremely pleased with the result! Would love if you would share this at Iron Chef Mom-White Chocolate! Ok, so I HAD to try these. I made them and mine didn’t flatten out, they stayed as little lumps. Did you have to flatten yours? Mine were also really dry and flaky like there wasn’t enough moisture. HELP PLEASE!!! Samantha, I’m so sorry. I didn’t have to flatten my cookies. Maybe cut back on the flour a bit. I spoon my flour into my measuring cups when I measure so it doesn’t pack down. The dough should be moist, like a chocolate chip cookie dough. Please let me know if you try them again. And how they turn out. What a pretty cookie! Love that you use jello for it – very interesting! I bet they did not last long at your house! This recipe will make about 40 cookies. I could only find white chocolate instant pudding for 1.1 ounces (32 grams). Should I add 2 more packages of the pudding? Sounds like you found a concentrated pudding. The 3.3 ounce package I used makes 4 1/2 cup servings. If yours does the same, I’d stick with one package. Raspberry jello + chocolate pudding = super delicious!! How yummy looking and pretty these are Joan! Yes and kids do grow up way too fast, enjoy every moment though there’s always a new kind of fun around each corner! Would it be okay to use strawberry jello instead? Do you believe they would have the same color? I’m sure the strawberry would be gorgeous, the colors when you make the Jell-o are very close. Do you actually make the pudding or just use the powder in the recipe? You just add the powder mix to the batter. BaMs Mom, I think that would be a wonderful combination. Hi Kursten, I used the Jell-O for both color and Flavor. Feel free to add more, it won’t hurt this recipe at all. I think the dried cherries would be a wonderful addition and take these cookies to the next level. Made these for Valentine’s Day and they turned out perfect! I used the 32g pudding (1 package) and it worked fine. Thanks for the idea! My daughter loved that they were pink. Laura, so glad your daughter enjoyed the cookies, happy belated Valentines to you! Do you think I could use a different flavor of jello and have it taste good? The possibilities with these cookies are endless, you could use Strawberry, Raspberry, Orange, probably any flavor Jell-o that you can find. 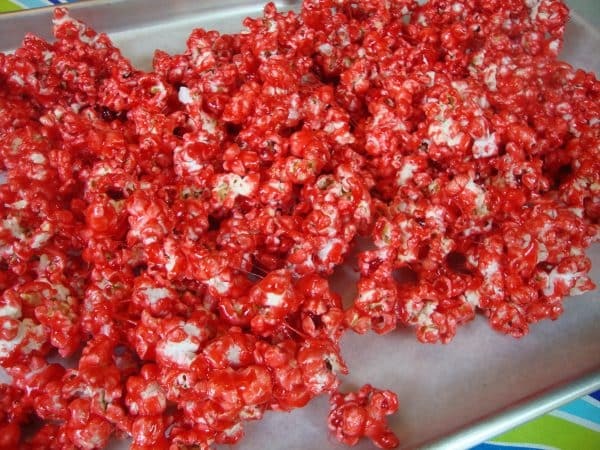 Let me know what flavors combination you go with if you decide to make these! How many cookies does the batter make? Maybe it’s just me, but I thought the cookies would have a cherry flavor. Perhaps the cherry jello was only used to achieve the pink color. I was disappointed. I just wanted to thank you for the recipe. I found you on pinterest. I made these yesterday and brought them into work today, which is perfect timing as DC celebrates the Cherry Blossom Festival! I also thought that they would have more cherry flavor, but the pink color is what mattered most to me, so no big disappointment. I can’t wait to experiment with using different color jello as coloring in other cookies. I also am in awe of how the pudding mix (I assume it is due to the pudding mix) really kept the cookies puffy, thick, and chewy. I have the hardest time getting chocolate chip cookies to stay that way, despite adding appropriate amounts of baking powder or soda. Delicious, and a big hit at my office! Beth, I’m so glad you liked them. The cherry taste is a subtle one, after 5-6 cookies you definitely know you’ve eaten cherry. I can tell you Lemon and Lime Jello are both very good in these cookies. We had our Cherry Blossom Festival 2 weeks ago here in Georgia. I should have made a batch to celebrate! I meant to answer Anonymous – I got 45 cookies using a tablespoon size cookie scooper. So probably a silly question but do you put the pudding in the mixture as just the powder? Or do you have to prepare the pudding & then mix it in? On this recipe do you just mix the pudding in as a powder? Or do you have to prepare the pudding then mix it in to the recipe? Yes Jessica, just add the pudding as a dry mix. Hi. So I tried a couple different cherry cookie recipes and I have to say that these were the best. But I didn’t have chocolate chips but Ihad white bakers chocolate that Imelted and drizzled over them. I also added chopped up marachino cherries. It was excellent. We sold them at a function to raise money for western iowa feral cat program. I just wanted to say thank you for these wonderful cookies! I’m so glad you enjoyed them and I love the addition of the cherries! So these cookies look delicious. I tried them, but they cowpied. Any ideas why this might happen. I did refridgerate my dough before baking do you think that could be the cause? Helen, I’m so sorry your cookies didn’t turn out. It may very well be because you refrigerated the dough, I’ll have to make up a test batch and let you know but the gelatin way set up will refrigerating. I can’t find instant white chocolate pudding mix in the grocery store. They have every other kind. Can you use vanilla pudding mix? Sarah, yes, you can use vanilla pudding mix in place of the white chocolate. I’m so sorry your store doesn’t carry the white chocoalte pudding mix, it really is yummy! depending on the size of your cookies, this recipe will make 3 dozen cookies or 4 dozen smaller cookies. These ARE delicious! This is my first time baking pudding cookies and they turned out fantastic! Thank you for the great recipe. I really wanted to try these out butmI live in brazil and I can’t find the pudding mix 🙁 Is there something i could use instead or simply not use it? Hi, the only pudding mix I have on hand is the sugar free. Would that work just as well in this recipe? (this is the 1 oz 4 serving pkg). Thanks! Yes, the sugar free Jellos work great in recipes! I am making this for a Valentine day potluck at work using a box of sugar cookies mix and adding the cherry jello and the color is just beautiful. I know I cheated but I ran out of flour. Do you think Strawberry jello would work? Of course it would. 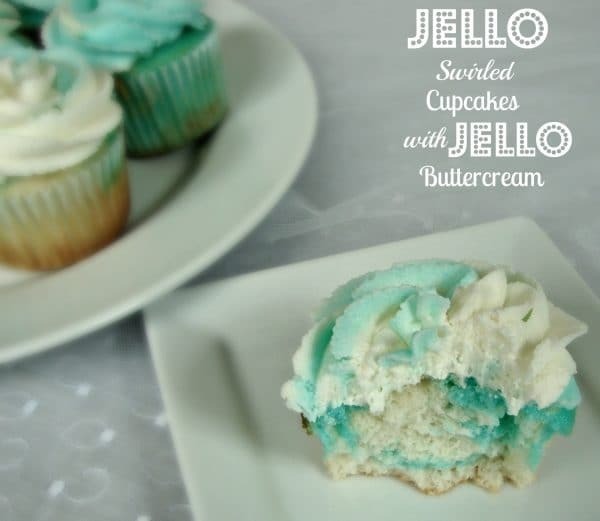 You can use any Jello flavor to make whatever flavor cookie you want. Made these with semisweet chocolate chips instead, so they’d go nicely with red wine when I had the girls over. Also had to use vanilla pudding because I couldn’t find the white chocolate variety. These are deeeeelicious! Definitely a recipe to save! I was thinking of making these for my sisters wedding. About how many cookies or dozens does this batch make? depending on the size of your cookies, it should make about 4 dozen. These cookies look delicious, I would like to bake some, but I wonder what ingredient I could use instead of eggs? Can you please suggest. I’m so excited to make these cookies. I had a quick question….What state is the jello when added to the mix? Do I add it as a powder, liquid or set? Thank you! you mix in the dry powder. Enjoy! I made these cookies and although they taste fabulous, whenever I try and make a colored cookie they brown ever so slightly around the edge and pink and brown in a cookie is just not a good look! 😉 How do you avoid having that happen? I tried covering w/foil, but the foil stuck to the cookies. Thanks! Sometimes you have to turn the temperature of the oven down. Lower and slower. Try reducing the heat by 25 degrees and adding a minute or 2 to your baking time. Wow, this looks delicious! Thanks for the recipe. I hope this will too good to eat. Thanks for the recipe. Its look delicious. I will try it. These have actually replaced chocolate chip cookies as my family’s favorite! Thank you! Friend is having a birthday party this weekend and I’m going to try these, I’ll keep you posted on how it goes! I made these a couple of months ago for a party and while everyone liked them, I thought they were greatly lacking in the cherry taste (I followed the recipe exactly, this was my first time making them). Should I try increasing the amount of Jell-O and if so, by how much? Thanks!